The term power supply generally refers to a source of de power that is itself operated from a SOL rce of ac power, such as a 120-V, 60- Hz line. 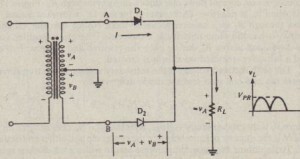 A power supply of this type can therefore be regarded as an ac-to-de converter. A supply that produces constant-frequency, constant-amplitude, ac power from a de source is called an’ inverter. Some power supplies are designed io operate from a de source and to produce power at a different de level; these are called de-to-de converters. 3. 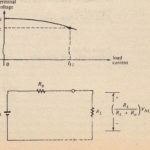 A voltage regulator hat maintains a substantially constant output voltage under variations in the load current drawn from the supply and under variations in line voltage. 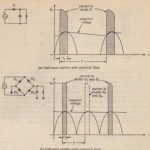 The extent to which each of the foregoing components is required in a given supply, and the complexity of its design, depend entirely on the application for which the supply is designed. For example, a de supply designed exclusively for service as a battery charger can consist simply of a half-wave rectifier. No filter or regulator is required, since it is necessary to supply only pulsating, unidirectional current to recharge a battery. 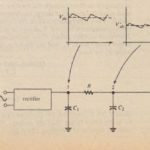 Special-purpose, fixed-voltage supplies subjected to little or no variation in current demand ~an be constructed with a rectifier and a large capacitive filter, and require no regulator. 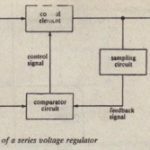 On the other hand, devices such as operational amplifiers and output power amplifiers require elaborate, wcll-reguiatcd supplies. Power supplies arc classified as regulated or unregulated and as adjustable or lixcd . Adjustable supplies arc generally well regulated and are used in laboratory applications for general-purpose experimental and developmental work. The most demanding requirement imposed on these supplies is that they maintain” an extremely constant output voltage over a wide range of loads and over a continuously adjustable range of voltages. 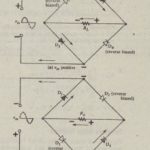 Some fixed-voltage supplies are also designed so that their output can be adjusted, but over a relatively small range, to permit periodic recalibration. 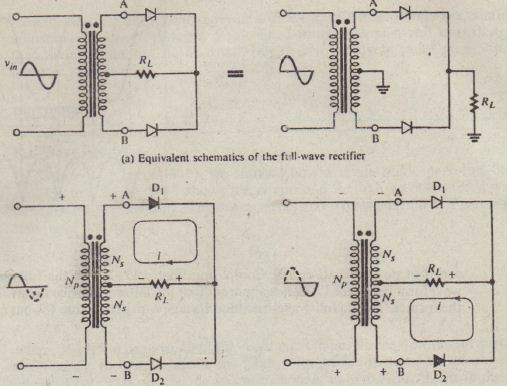 In ChapterB (Section 3-6), we showed how a single diode performs half-wave recti! cation. 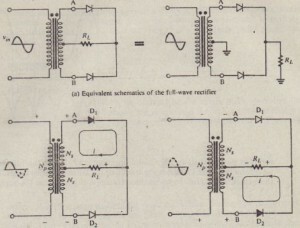 The circuit and the half-wave-rectified waveform developed across load The average (de) and rrns values of a half-wave-rectified· sine-wave voltage. where VI’R is the peak value of the rectified voltage. 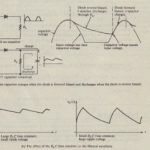 Notice how the orward voltage drop across the diode affects the peak value of the rectified waveform shown in Figure 17-1: The peak value VpR of VL eq-r-ls VI’ – 0.7 (for a silicon diode). 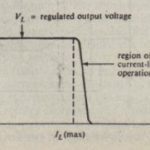 The 0.7-Y drop can be neglected in many power-supply applications because of the large ac voltages present. Assuming that the ac voltage is a sym.netrical sine wave. the. 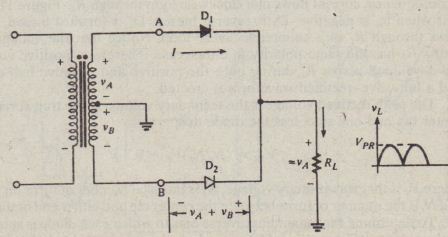 diode in Figure 17-1 must be capable of withstanding a peak reverse voltage of VI” volts, since that is the rnaximur reverse biasing voltage that occurs during one com plete cycle. Recall that the peak-inuerse-uoltage (PlY) rating of a diode determines its maximum .permissible reverse bias without breakdown.